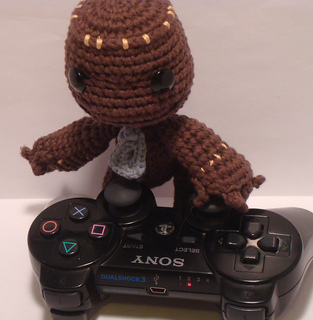 When I first played Little Big Planet, I couldn’t get over how cute Sackboy was, and how much I needed one. 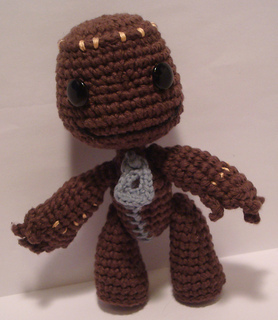 This doll was actually THE reason I HAD to learn how to crochet amis. I had a hard time finding a pattern I liked, and ended up, after much trial and error, just coming up with my own. 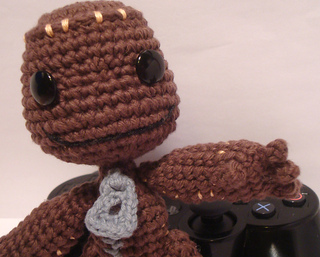 I wasn’t able to find a real zipper that looked like the one in the game, so I crocheted a sort of exaggerated likeness and stitched on the zipper teeth. You will also need two black button, preferably glossy, with a low, not too domed profile. Yarn could be any worsted weight yarn that is stiff enough to hold it’s shape and not stretch or give when stuffed.